The name was adapted after the good ship Volunteer capsized off Cape Byron with loss of crew. 120 casks of tallow was washed ashore giving rise to the name - We had oil spills back then too..? The Volunteer was lost on 7 August, 1864. The Northern end of Tallows backs onto Arakwal National Park which was established in 2001. 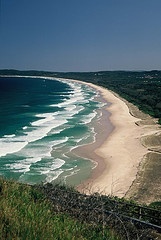 Tucked in behind Cape Byron, the northern end of Tallows is normally very sheltered, giving rise to the name Cosy Corner . Depending on the wind direction and conditions it can be quite pleasant here while in the rest of Byron it's blowing a gale. 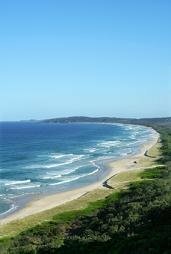 Heading south, the beach backs onto Suffolk Park which lies about 6 km - 10 minutes drive from the centre of Byron Bay. A separate community with a separate identity - Suffolk Park feels a long way from Byron Bay. It has it's own shopping centre with it's own pub - the Suffolk Park Hotel. You can check out the Shopping Centre Facilities here. Suffolk Park offers a large range of Holiday Accommodation and is a good place to look for Beach Front Holiday Accommodation - especially if you find the rest of the areas Beach-front accommodation out of your price range - and you could be lucky while you're here and not get strong onshore easterly winds. Tallows is a good place to see the sunrise and the dog-friendly area of the beach a good place to walk the dog. Right at the South end of Tallow Beach is Broken Head. Where you find Broken Head Holiday Park - They have self contained cabins, camp ground with facilities, powered sites, powered sullage sites (? ), kiosk, laundry facilities, free wireless internet access and more..
As well as being right beside Tallow Beach, the Caravan Park is also close to the other Broken Head Beaches which include Kings Beach, Brays Beach and Whites Beach. Check them out - well worth the treks to get there - which is through bush and rainforest - an experience in itself..